The luminosity of oil paints intrigues us all. If you've never painted in oils but would like to start, or if you've been away for a while and would like to review the basics, this class is for you. 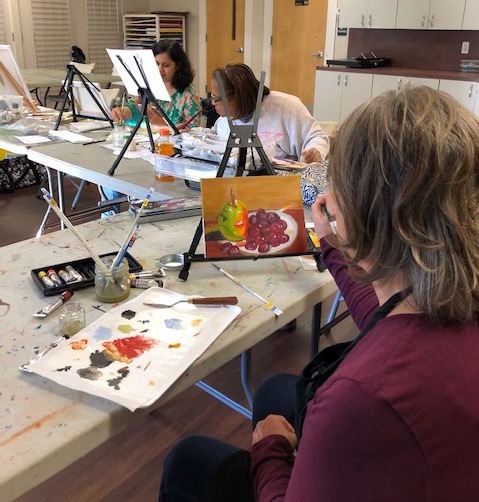 Lori Langsher will start from the beginning: setting up your palette, mixing of paints, brushstroke and application, and then move onto learning to look at your subject and light source as we create meaningful artistic expressions. A variety of subject matter, including still life, landscape, and portraiture will be part of our focus, with students being encouraged to use personal inspiration in their work. These materials are available at Jerry's Artarama, Michael's, or online. Paints: Basic colors: titanium white, ivory black, cadmium red medium, cadmium yellow light, ultramarine blue, burnt sienna, raw umber, yellow ochre. You can opt for the basic color selection, red, yellow, blue, white and black, for the first class, and add optional colors for subsequent classes, if desired. Optional: colors might be alizarin crimson, cerulean blue, cobalt blue, violet, emerald green, & burnt umber. Let your budget be your guide. Beginner kits with a selection of small tubes are acceptable. Basic: ½" filbert, ¼" filbert, 1" flat (measured across their width) ½" round, (measured from the metal ferrule, to the tip). Optional: finer tipped brushes for more detailed work, metal palette knife. Brush sets are acceptable. They should include flat and round types, in various sizes. Price is an indicator of quality, nylon synthetics such as sablette or taklon representing good value. ODORLESS thinner/spirits (Turpenoid, Mona Lisa or similar). NO turpentine! You will need a clear glass or metal container with a cover to hold thinner. ). Optional: linseed oil – increases luminosity, yet longer to dry, liquin - speeds up drying time, gives a glossy finish. Painting surfaces: three 8" x 10", three 11" x 14" canvas boards, both often sold in 3-packs. It is not necessary to purchase stretched canvases at this time, yet one of each size is optional. Palette: Basic: A roll of freezer paper can be cut into palette- sized rectangles OR a 12" x 16" disposable palette pad (more expensive but convenient). Miscellaneous Recommended: disposable gloves, rags or paper towels, apron or smock. Optional: a large plastic shopping bag, a sealable palette box, (fisherman's tackle box), or a large, flat Tupperware container or plastic shoebox will work well as a transportable storage solution. About the Teaching Artist: A resident of West Windsor, Lori Langsner has recently retired after a rewarding career in arts education in the NYC Public Schools. Lori has an MA in Special Education from Brooklyn College, a BA in Art Education from Queens College, and has continued her studies at the Art Students League, Princeton Arts Council, and Mercer County Community College. 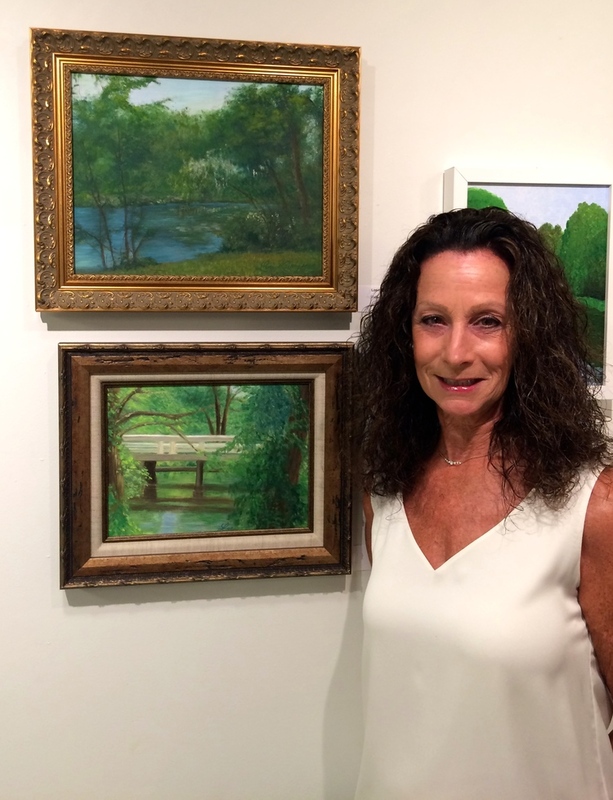 Lori’s paintings were recently on view at Princeton Arts Council, and have been included in exhibitions at Mercer County Community College, Mercer County Library, and Prallsville Mills. Lori has been not only a classroom practitioner but is currently a facilitator of a learning community of other visual arts teachers around best practices and teacher effectiveness in the arts program at www.Startchr.nyc. 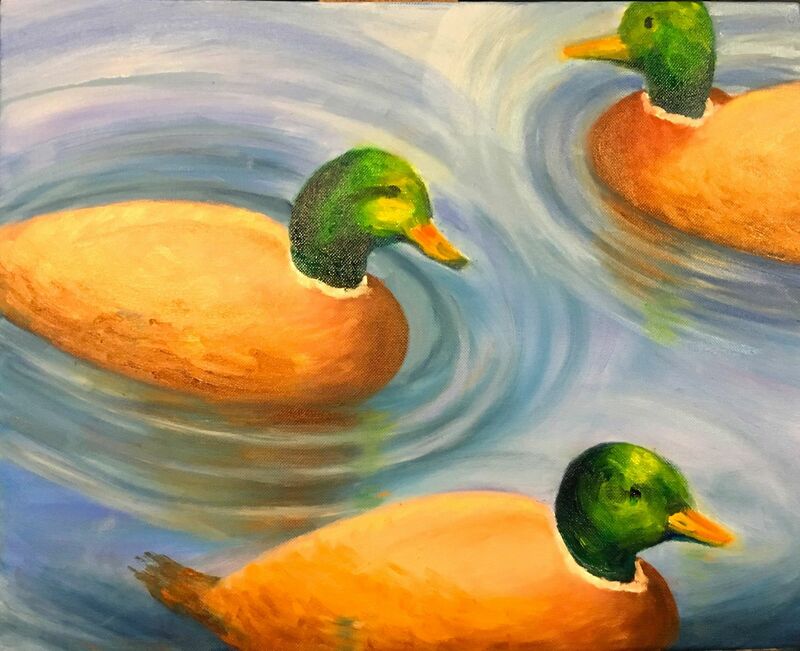 Lori is excited to reconnect with her own personal art as an “en plein air” painter in oils, surrounding herself with nature and art. She looks forward to sharing her passion for oil painting with those who want to start their own personal quests into the world of art.